Eugenie Le Sommer scored a double for France. 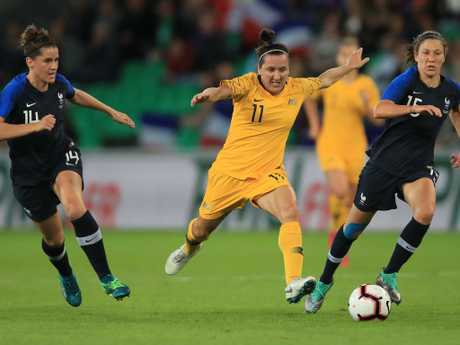 AN UNDERSTRENGTH Australia suffered a 2-0 loss to Women's World Cup hosts France in a friendly in Saint Etienne early on Saturday (AEST). Australia went into the match having suffered just one loss in the last eight outings, but their rejigged backline was under constant pressure with France dominating possession. Australia failed to test French goalkeeper Sarah Bouhaddi until the final seven minutes when teenage substitute Mary Fowler was denied. 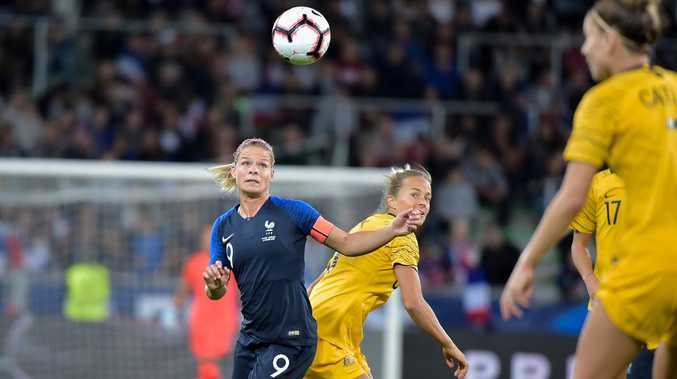 France were on the front foot from the outset with the opening stages marked by a nasty shoulder injury for France captain Amandine Henry, after she fell heavily under a late challenge from Matildas fullback Larissa Crummer. France missed a host of gilt-edged chances with Gaetine Thiney, Kadidiatou Diani and Valerie Gauvin among the main offenders. France finally got the goal they deserved 11 minutes into the second half as Le Sommer tapped home after Mackenzie Arnold was unable to grasp a loose ball in the penalty area. Le Sommer doubled the advantage in the final minute with a superb long-range shot. Australia will meet England in London on Tuesday ahead of home matches against Chile next month.